2014 Donate Life cycling team. Other cycling goals on my checklist have fallen since then. In 2013 I rode 100 miles in a week and made it 35 miles in one ride. Check! My goal for 2014 was a half-century ride of 50 miles. That goal fell a couple weeks ago. Check! So what goal did I see fall at Saturday’s Fight Back Festival? It wasn’t the mileage. Look at that picture at the top of the page. Notice anything? The reality is New England is one of the worst regions if you need a life-saving transplant. Our average wait time is among the longest because we have fewer registered organ donors. People like me, waiting for livers, are ranked by something called a MELD score. The higher the number, the worse shape you’re in. Basically, it’s a rating that gives you your odds of dying in the next three months. When I was at 36 MELD in March 2012 there was a 50% chance I’d be dead in the next three months. In the Southeast the average MELD for transplant is 22 (10% chance of dying in next three months). Here in New England? Your MELD needs to be in the mid-thirties to be at the top of the list for an organ. Take it from me, I was much, much sicker at 36 than I was at 22! We even talked about moving to Florida to save my life. What does that have to do with my goals? After my transplant I vowed to do whatever I could to spare people from going through what I endured. That means I talk with people, email people, write and speak about organ donation whenever and wherever I can. When I started cycling again to regain my strength after transplant, I wore my Donate Life jersey that I had specially made. At group rides I saw cyclists fly by me wearing their team jerseys advertising local pubs or riding clubs. I started dreaming of a line of cyclists on the roadside someday here in Maine raising awareness for organ donation. Saturday, I saw that. At one point I was sixth in a single-file line of Donate Life cyclists! 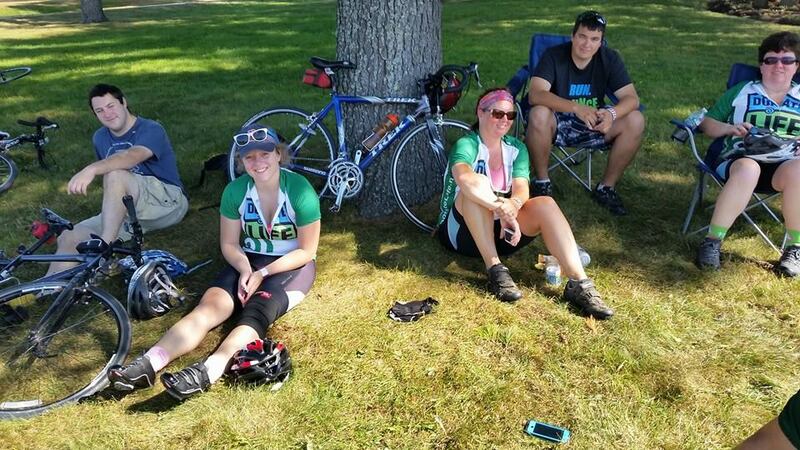 When I came across the finish line, my teammates were sitting in the shade over to the right on a grassy hill waiting for me since I had hung back to encourage some newer riders on our team. Their hoots and hollers made me feel good but what made me feel better was the sight of them sitting as a team, wearing their jerseys. I know that everyone that saw our team on Saturday, at least at some level, considered what it means to donate life. I know I had conversations with a few about my transplant and the importance of organ donation. I never want to go through what I endured again on my transplant journey. It was a hell I would not wish on my worst enemy. But now, 28 months out, I see the good that has come. Because of this mess, I live in an awesome neighborhood, am healthier than have been in 25 years and am plugged into an incredible church family. Take a look at that picture at the top of this page again. Other than my dad and Robin, I had no relationship with any of those people just a year ago. And now, they are people who have come alongside, welcomed me, accepted me and PUSHed me to be a better person. Several of them were there PUSHing and encouraging when the 50 mile goal fell. When I saw them show up Saturday wearing Donate Life jerseys that they purchased on their it meant so much to me. So what now? What’s the next goal? To celebrate my 3 year liverversary on 5/7/15, I will be riding the Trek Across Maine June 19,20 & 21. It’s three days and 180 miles. In March of 2012 I had a 50/50 chance of dying. I spent 26 days in the hospital and had my own, special “code blue” incident that sent the medical staff running. Both Robin and I doubted I would get the transplant I needed in time. Because of the selfless gift of my donor, (video) this winter I will PUSH myself to train for a ride the scope of which I have not tried since I was 17 and toured Scotland on a bicycle. The truth is, I’m nervous about it. I wonder if it will be too much. I need you to give me a PUSH. Thanks Donate Life team! You guys helped me accomplish one of my goals even though I’d never spoken of it with you. To order your own Donate Life biking jersey just email sales@bikingthings.com and ask Luis about it. He’ll be glad to hook you up. This entry was posted in cycling, exercise, transplant recovery and tagged American Liver Foundation, Bike biking, chronic illness, cycling, cycling jersey, direction, Donate Life, donate life biking shirt, fight back festival, liver transplant, recovery, team, Trek Across Maine. Bookmark the permalink.